This website provides information about the information technology (IT) services used at Cornell, and the people and processes that guide them. Cornell's IT Communication and Documentation team is responsible for the website and for maintaining the information and can be reached through the Comments? 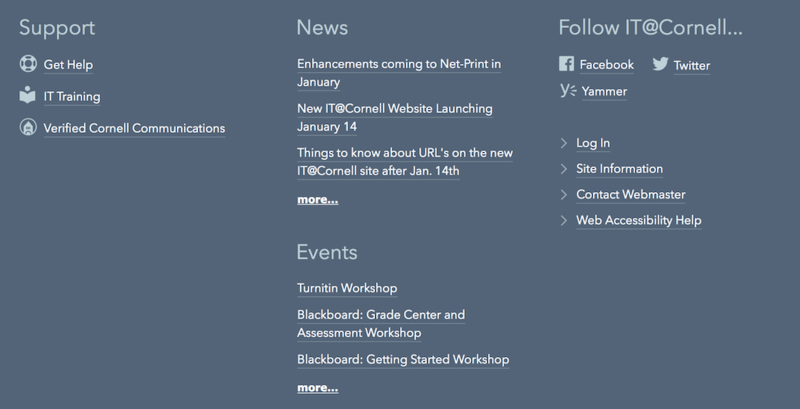 box at the bottom of most pages, or by writing to the IT@Cornell Webmaster. The website is searchable from Google and other search services, or you can also try searching right on the site, using the Search IT@Cornell box in the green bar on the upper right of every page. We're using a new tool that allows you to filter and sort the results, to find the content that matters to you more easily. We've tried to make it easy to browse for the most needed information. In The How Can We Help? 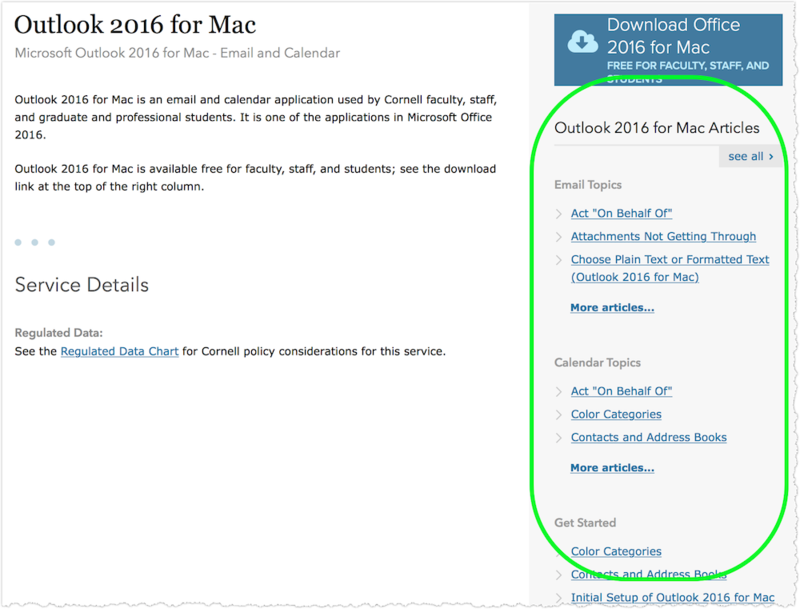 box on the home page, in addition to search, you can also find direct login links for Cornell mail, web conferencing, and collaboration services. Clicking More Login Links will give you fast access to even more. Login Links are also available from a drop-down menu in the green bar on each page. 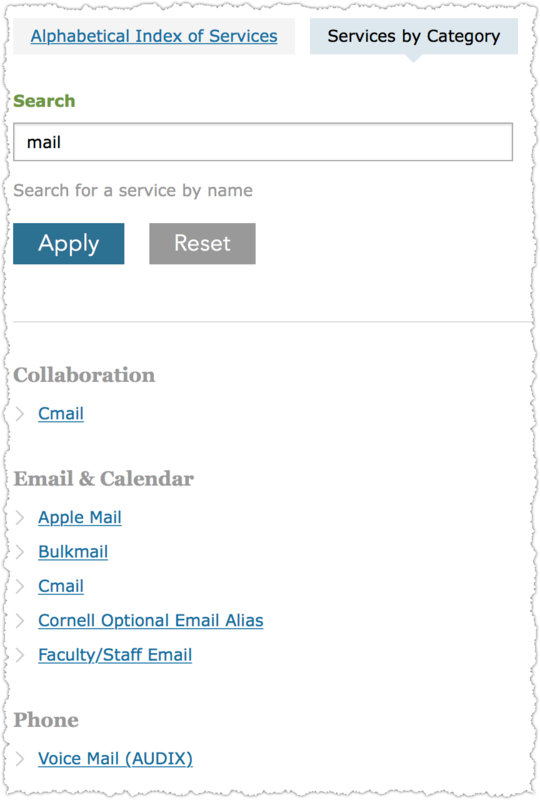 Clicking the Services button on any page will take you to a list of all IT@Cornell services. If you'd like to narrow down the entries on the list, you can enter a term in the Search box. Once you've made your way to a service site, in addition to the information in the links in the main content area, you can see a list of links to individual articles in the right-hand sidebar. The sidebar shows the first three articles for each topic. To see every article associated with the service, click see all. To just see all the articles associated with each topic, click More articles... after the third article for the topic. Scroll all the way down to the bottom of the page to find even more links to IT information, including the latest IT News and upcoming events.